In celebration of the Feast of Saint Rita, next Monday morning visitors are invited to enjoy free of charge bicarbonated medicinal mineral water rich in calcium and magnesium sulfates (declared by Royal Order of the 4 of October 1895 to be of public utility) from the natural spring at the chapel devoted to this saint located at 28 calle de las Carolinas in the district of San Gervasio (a short walk from Josepets for those taking the tram from the Plaza Cataluña). 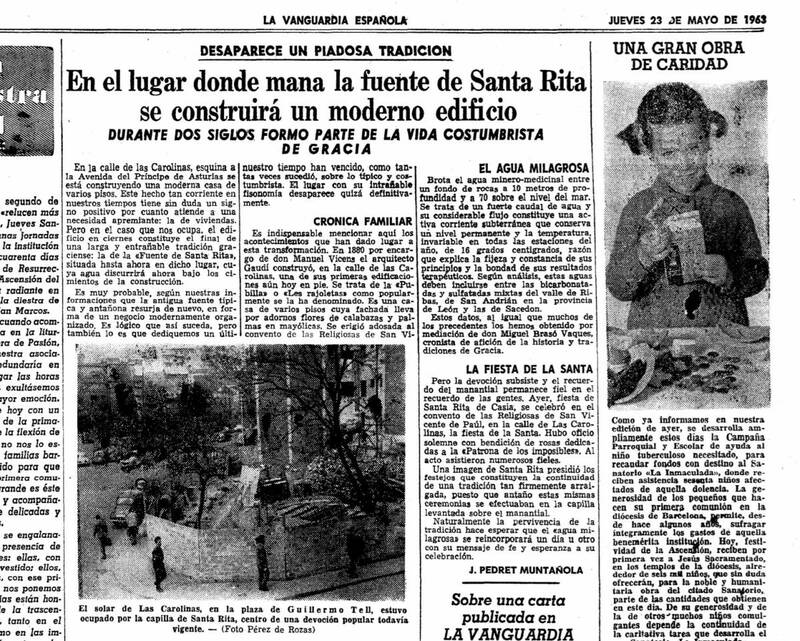 Many people in Barcelona thus took their first yearly dose of Santa Rita mineral water, lauded for three decades as the best remedy for stomach, liver, kidney, intestinal, and urinary ailments by such distinguished medical experts as Codina Länglin and Giné Partagás. Water from the Santa Rita spring is furthermore a delicious, exceptionally refreshing and tonic table water. The story dates back to a point in the eighteenth century when a group of Discalced Carmelite monks who maintained a hospice on the site discovered the curative properties of the carbonated water issuing from a spring there, which they dedicated to Saint Rita, the patroness of impossible cases. When this spring was declared to be of public utility in1895, the registered owner of the property, Carmen Fernando, began to market the water commercially, a practice that continued until the mid-twentieth century. 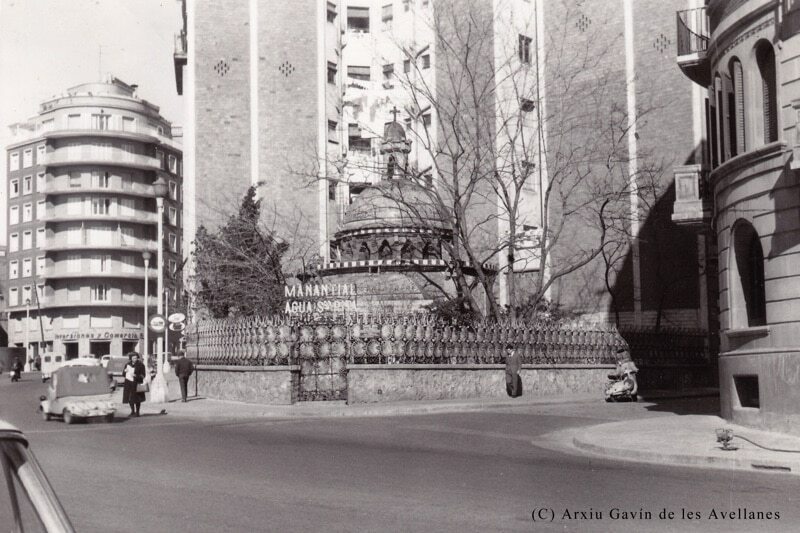 During the renovation of the house and property undertaken between 1925 and 1927, Juan Bautista Sierra de Martínez constructed a new chapel dedicated to Saint Rita around the spring. Successive owners continued to sell the water commercially until 1963, the year the chapel was demolished to make way for a modern apartment building. During this period the owners continued to open the garden to the public every May 22 so that anyone who wished could pray to a statue of Saint Rita placed in a specially prepared room where a mass that included a traditional blessing of the roses was celebrated. Many older residents of Gràcia still remember this annual event. As a means of keeping faith with this longstanding tradition, once Casa Vicens has been fully restored and rehabilitated, Saint Rita will have her very own niche in the garden and every May 22 the public will have the opportunity to enter the grounds free of charge to purchase roses and light candles in her honor. In 2016 the management of Casa Vicens decided to delegate responsibility for the yearly sale of roses and candles and cede all the profits derived from that activity to neighborhood-based charitable organizations. Last year the non-profit association Gràcia amb el Sàhara participated in this initiative and this year the Nexe Fundació, a neighborhood organization that provides vital support services for children with multiple handicaps, will take charge of the sale of Saint Rita’s Day roses and candles. A mass in honor of Saint Rita will be celebrated in the convent church of the Hermanas de la Caridad (Carrer de les Carolines, 12) at 11am on May 22. The church will be open to the public that day from 9am until 7pm. Casa Vicens travels to Moscow!